Our clients were passionate about their environment as an expression of themselves and as a vehicle for their lifestyle. 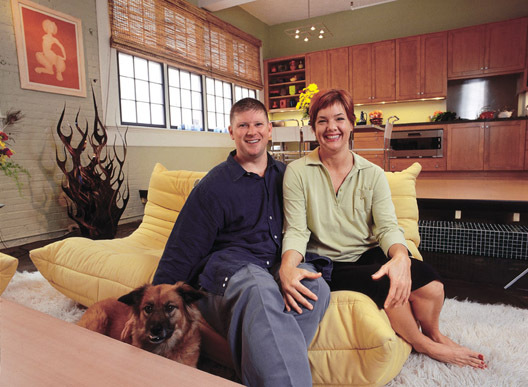 They sold everything they owned, including an Uptown house and a car in order to buy a one-bedroom warehouse loft condominium that they could renovate to accommodate their needs. The existing condominium had a long entry hallway, a large open living and dining area with a small utilitarian kitchen in one corner, a large bedroom with reach-in closets, and a large bathroom with a miniscule lavatory. The living area lacked definition; it was simply too rambling and shapeless to be comfortable or functional. 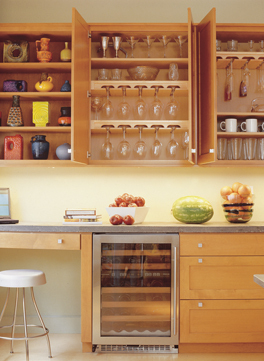 The kitchen did not have enough counter or cabinet space. The window sills were too high for the views to be appreciated. The concrete ceilings and floors multiplied the reverberations, making the space echo like a cave. However, the project did have great potential: an open floor plan, high ceilings, large industrial windows for natural lighting, and clients who were open and eager for ideas. To accommodate their needs, we carved out of the bedroom a large walk-in closet and an entry foyer space. To better define the living space, we gave it distinct borders: a kitchen / dining platform bounded one side, and a new media room / guest room gave a crisp edge to the other side. Within the rambling living space, we formed a small box: a well-equipped media room with its own ceiling of curved acoustical metal panels. We designed and fabricated a wall of custom cabinetry to discreetly house the media equipment and accessories. The kitchen was stretched along two walls and raised on a platform to provide a higher perch on which one could better experience the windows. An acoustical insulation was sprayed onto the concrete ceilings to abate the echoes. 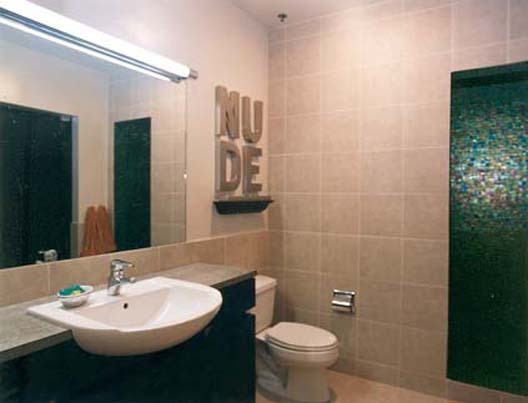 the bathroom was stripped to a stark simplicity complemented by a few touches of lush finishes and forms: iridescent glass mosaic tiles and a curved lavatory bowl semi-recessed into a custom cabinet and concrete countertop. 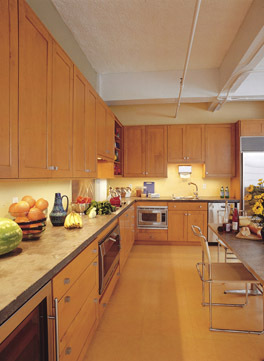 This project was published in the Fall 2002 issue of New Orleans Homes and Lifestyles magazine.